Recently I had the opportunity to walk through Point Houmas plantation across the river, close to Donaldsonville. Currently abandoned, Point Houmas sits on a point called Point Houmas on the edge of a massive sugarcane field. The whole point has been zoned heavy industrial, threatening the future of the plantation home. The purpose of our visit was to determine if the plantation was able to saved and moved across the river to land owned by my in-laws in Darrow. 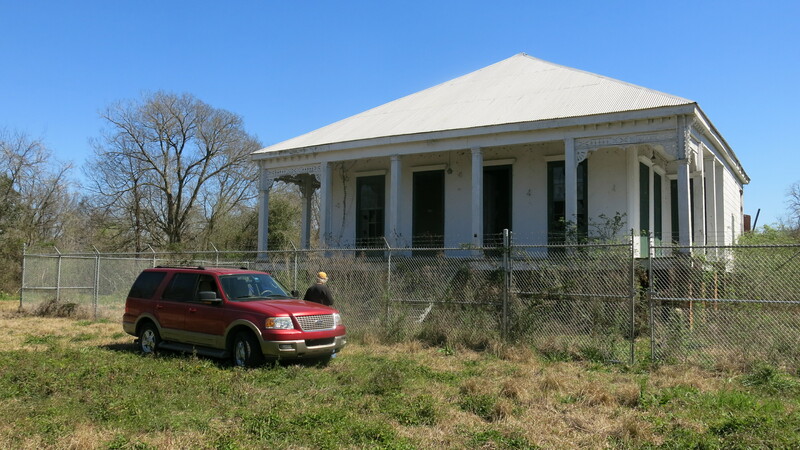 The moving and restoration of Point Houmas would have been conducted under their non-profit, 360 Grassroots. Point Houmas is an incredible plantation home. The building is still in great shape, given that it has sat neglected for at least 35-40 years. Much of the original plaster on the ground level ceiling still survives. The 8 foot brick piers that lift the building off the ground are in good shape, although could use a little bit of repointing here and there. The house is so high off the ground that you could easily drive a care under it. The building does have a relatively new roof and does appear watertight, although the chimneys had been capped and cut when the roof was added. As you can see in the pictures, the house has a very simple Creole-style floor plan, with 2 parlors in the front and 3 rooms in the rear. The front porch wraps around about half the house, while the rear porch was enclosed to create a faux loggia. The ceilings are 16′-17′ high (they make you feel pretty small as you walk through the house), and it appears that the pocket doors separating the parlors are original. The style of Point Houmas is Eastlake, with a touch of late-Italianate due to the appearance of dentil work. This allows me to roughly date the home to the 1870s, early 1880s. The owner of Point Houmas plantation, according to Adrien Persac’s 1858 “Map of the Mississippi”, was a man by the name of Colonel J.L. Manning. I have not been able to find too much history on Col. Manning or Point Houmas, but plan to carve out some time this year to head to the archives at the Historic New Orleans Collection to dig a little deeper. 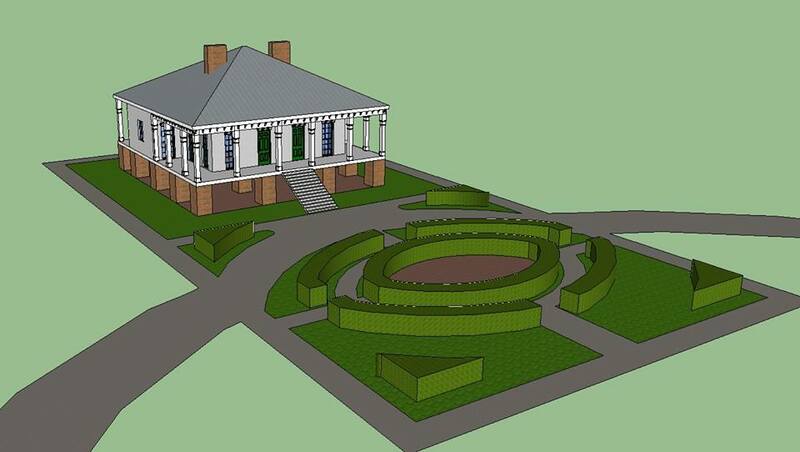 My good friend, Ian Crawford, director of the Jemison-Van de Graaff mansion in Tuscaloosa, was able to put together a rendering of what we think it may have looked like originally. Point Houmas is an absolute gem on River Road, but unfortunately the cost of moving and restoring the plantation was well beyond our limited budget. As for now, it is still sitting on the point across the river from The Cabin, waiting for a friend to save it from what seems an inevitable date with an industrial plant. As far as I know, the owner is willing to donate to the building to a non-profit as long as the person pays all moving costs. I will update in the future if I hear any news on the plantation. Please spread the word about this historic Louisiana plantation!